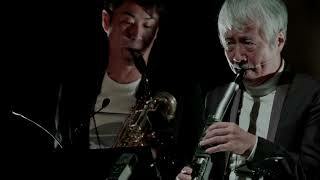 The Japanese saxophonist, composer and producer Yasuaki Shimizu encompasses an astonishing spectrum of styles. He weaves pop, glitz, Japanese folk, and ornamented Mediterranean melodies into sound tapestries that conjure up memories of the collaborations of rock icons David Byrne and Brian Eno in the early eighties. Danceable and at the same time saccharine, surreal, and crystal clear, shrouded and ecstatic. The more you hear, the more you realize that he constantly sets you on the wrong foot: he goes in musical directions that you least expect. He refines his music with advanced production techniques, derived from disco and dance, making him popular with DJs. In addition, Shimizu worked with industry greats such as Björk and Ryuichi Sakamoto. With a reissue of his album from 1983, he currently enjoys success with a wide audience. The preparations for his first live shows in Europe in a decade are in full swing.